Aug. 26, 2011, 6 p.m. Creating a separate space for covering big events is a way to avoid flooding the feeds of @nytimes’ 3.6 million followers. By Megan Garber @megangarber Aug. 26, 2011, 6 p.m. The paper’s main account, @NYTimes, has over 3.6 million followers; the brand new @NYTLive has only 2,200. Not at all shabby for an hour-old account, but why wouldn’t the Times use its biggest Twitter megaphone? First, it solves a problem faced by many news organizations, the small and especially the big, that use Twitter to share stories across several topics and coverage areas. 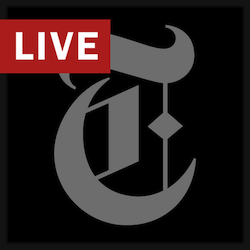 By breaking out the breaking news from the everyday news — the you-care-about-it-now from the comparatively evergreen — @NYTLive gives the Times the flexibility to live-tweet big stories without flooding its main account and overwhelming the other stories that are sent out on its feed. You may recall that Andy Carvin recently met some criticism for over-tweeting, the main complaint being that his uber-curation drowns out the other Twitter feeds users follow; to the extent that Andy Carvin is a one-man news organization, he’s dealing with the same problem. Stelter himself used a separate account, @brianstelternyt, to livetweet a tech conference earlier this year, but the account seems to have gone dormant. @NYTLive is also interesting, though, because it allows the Times to be much more cavalier — in the best sense of the term — about including conversation in its Twitter feed. While @NYTLive still very much lives under the umbrella of the Times, it’s not the outlet’s grand, uber-branded, multi-million-follower-strong feed. (Again, its current follower count: 2,000+.) The fact that it’s a subsidiary account gives @NYTLive more freedom to be experimental and responsive. (“This feed is not active every day,” @NYTLive’s intro text notes. “Follow it as a supplement to @nytimes.”) And it’s also interesting to note, along those lines, that the feed’s tweets so far seem to have been sent from Tweetdeck, a publishing tool that lends itself especially well to conversation and social interaction, rather than to the simple publishing of links, on Twitter. (Tweets posted to @NYTimes, on the other hand, are sent “via The New York Times.”) And @NYTLive tweets (again, so far) seem to be more invested in using hashtags like #irene and #ireneqanda than the Times’ big account is — another indication of conversation. POSTED Aug. 26, 2011, 6 p.m.
Garber, Megan. "The NYT launches a Twitter feed for live coverage of breaking news." Nieman Journalism Lab. Nieman Foundation for Journalism at Harvard, 26 Aug. 2011. Web. 20 Apr. 2019. Garber, Megan. "The NYT launches a Twitter feed for live coverage of breaking news." Nieman Journalism Lab. Last modified August 26, 2011. Accessed April 20, 2019. https://www.niemanlab.org/2011/08/the-nyt-launches-a-twitter-feed-for-live-coverage-of-breaking-news/.